Summer vacation season is almost over! Kids have (mostly) returned from camp, families are getting in their last weekend road trips and stopping in hotels and motels on their way to famous landmarks, and bed bugs are on the move! 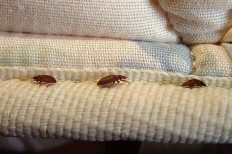 You can find bed bugs anywhere, in the cheapest motel or a 5-star luxury resort, but they can only stow away with you if you are not careful. Here is a video from PestWorld.org about how to inspect your lovely hotel room and make sure there is nothing lurking and waiting to bite! Don’t put your luggage down on the carpeting until after you have inspected the room, Leave it in the hallway or put it in the bathroom. Check the mattress, head and footboard and upholstered furniture for any sign. If you find signs of bed bugs and ask for another room, make sure it is not a room adjacent, directly above or directly below the infested room. We hope that all your travels this summer so far have been safe, fun and bed bug free! Have fun getting ready for fall!